I have so many good memories of growing up with Maribeth; she lived on Cape Cod and our families would get together each summer for a couple of weeks, and usually on Thanksgiving and Christmas. She’s a year younger than me, but that never mattered. We were happiest on the beach, or riding our bikes, or playing with our Barbies…at least until we were 12 or 13 or so. That’s when we started to grow apart a bit. I started wanting to do things with my friends during the summers, but still…every Thanksgiving and Christmas (except when I lived in Japan) were spent together. Now, I think we’re trying to set up our own tradition of spending Thanksgiving & Christmas together; this picture, in fact, is from our Thanksgiving celebration, which as you can see with filled with food (and those were just the appetizers!). Lovely tribute to a special cousin! The Thanksgiving appetizers look wonderful — great shot! Thank you for stopping by mine! I love this, too! 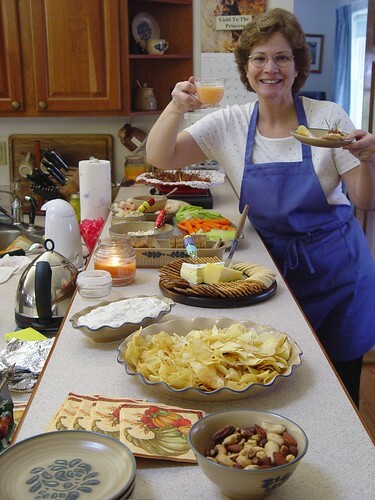 She looks so happy and welcoming, and the food looks great. I’m glad you two are reconnecting. I probably haven’t talked to any of my cousins in a quarter century or more. Heck, they’re way over in NJ! Everything looks so delicious! I am hungry now. LOL. What a pretty lady Maribeth is. Hi Maribeth… nice to meet you. This is such a sweet photo, thank you for sharing with us. What beautiful shot of a yummy feast topped w ith a lovely tribute. Thanks so much, J. Of all the things I am thankful for in my life being reconnected with you is at the top of the list!